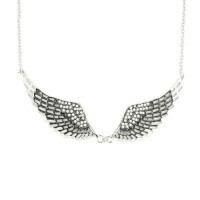 Ladies Black Angel Wing with clean clear imitation Crystals makes up this Necklace. Made from clean 316L Stainless Steel. Pick up the matching Earrings (SSE 67) and be you all set for the ride.